If you’ve tried everything, read every book on BPD, gone to therapy, whatever… maybe it’s time to invest less than $20 in your relationship? Need a new way to interact with someone with Borderline Personality Disorder? Have you tried everything and nothing seems to be working? Have you read several self-help books on the subject, even the best-selling ones, and your life is still filled with pain and conflict? If so, I have a book for you to read. I wrote it because a few years ago I was in a very similar situation. My wife of more than 20 years has BPD. One of my daughters also exhibits BPD traits. I’ve seen the disorder from the standpoint of a spouse and a parent. Believe me… it was hell. What did I do? I got educated about the disorder. I learned effective strategies and tools to make my life easier. Then I practiced them and mastered them. It has made things much easier for me and my family. 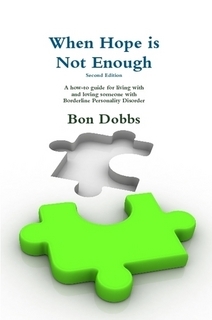 I decided to write it all down in my book When Hope is Not Enough, Second Edition: a how-to guide for living with and loving someone with Borderline Personality Disorder (aka WHINE). If you want your life to be more calm, I urge you to read this book. The strategies and tools in WHINE actually work. You can buy a printed copy of WHINE online at Amazon, Barnes and Noble and other major Internet retailers. One query though, I am in Australia. . . . how would I get to purchase this book ? I am also one of those dinosaurs who doesn’t use credit cards or Paypal etc. Is it available in stores anywhere ? Well, right now it is only available on line through Lulu. You can use PayPal, Credit Cards and (I think) an online check. But cash is not an option. I will be purchasing a ISBN for it shortly (I needed some up-front cash) and it will be available on Amazon, etc. However, book stores is a difficult situation. If you know anything about the distribution business, it is difficult to get a book in book stores. I can update all of you if it gets to that point. But as of right now, it’s online only – and they will ship it to you. I might offer it on eBay as well, but again you need an electronic method of payment. In the meantime, you might want to get into the 21st century – haha. I’d love for you to have a copy, but I can’t think of any other way to get it to you.